NOTE: Signing up or Logging in via OpenID is no longer officially supported from any of our sites. Currently, https://openid.stackexchange.com/ is still on the internet, but we are in the process of completely removing it. Stack Overflow was an early and strong supporter of OpenID. We built our sign up/log in flow around it. We were idealistic and had high hopes, but these hopes weren't realized. Over the years people have wondered if OpenID is dead. We've had to remove support as OpenID providers pulled support or shut down. The time has come to part ways. The reality is OpenID support has created a ton of complexity in our codebase and the number of users actively using OpenID simply don't justify that cost. Users have spoken with their actions. 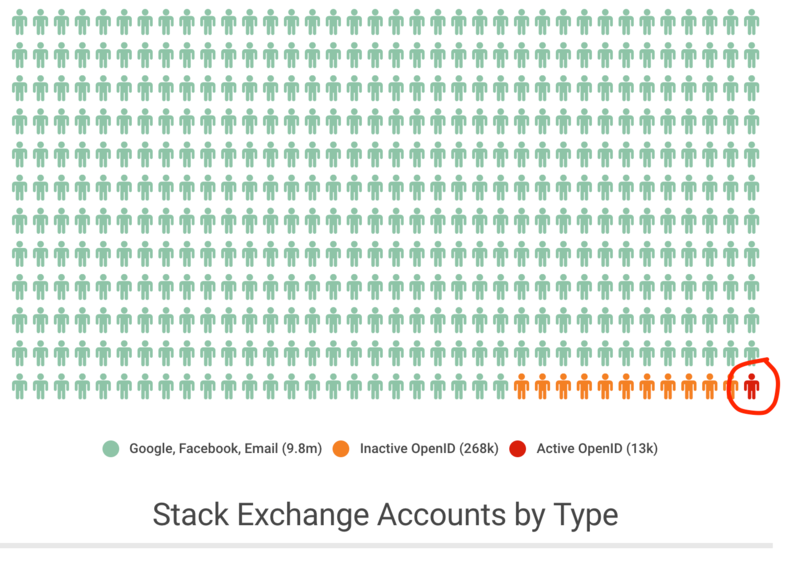 You prefer Google, Facebook and Stack Exchange (aka email/PW) based account auth. Of our 9,813,747 accounts around one-tenth of a percent are actively using OpenID (defined as having visited a site in the past 12 months). If you include all the inactive accounts it is still less than 2.9% of all accounts. Obviously, if your account relies on OpenID, then make life easy and go now and add your Google or Facebook credentials or set up email/password auth. If you've forgotten what you credentials you use to login, then click this link to refresh your memory. If you don't see one of the three account types shown in the image below (Google, Facebook or Stack Exchange) then click the "add more logins" button to add one of them to your account. Remember, SE OpenID accounts are really email/pw accounts handled through complicated OpenID code path. They will be migrated to a simpler email/pw only code path as a part of this change. No extra work required on your part. If you have any problems in this transition or can't successfully add a new provider to your account, please contact us and we'll get it sorted out for you. I'm using https://openid.stackexchange.com/ to log in on SEDE, the Stack Exchange Data Explorer. Will there be another kind of integration between SEDE accounts and Stack Exchange accounts or do I need to switch providers there as well? ChatExchange is a Python API for Stack Exchange chat. It logs in by visiting openid.stackexchange.com, logging in (scraping the page for fkey), and then using that cookie to log into a Stack Exchange site. The cookie from Stack Exchange login then gets used to authenticate for chat. SmokeDetector uses ChatExchange. If that flow breaks, we'll need to know about it so that we can put the necessary patches in place and not have extensive downtime while we figure things out. A transition period where both the old flow and the new flow work would be ideal. The timeline says June - run an announcement banner for users who sign in with OpenID. Why wait until June? Shouldn't the announcement banner go up immediately? How about also showing the banner to users who use StackExchange as their OpenID provider? This is also a way to speed up a lot the time to show webpages. The fastest load time is with the lynx browser. Lynx is fast because it does load images. Lynx browser also happens to be favored by blind people with text readers. I use lynx 99% of the time. No interest in seeing images except for click-bait pages. I use firefox for www.sharelatex.com, to vote or answer in stackexchange websites, for google agenda, and for shopping. The rest, among which news.google.fr, gmail.com, searching (including in stackexchanges websites), ... I do that in lynx browser. I just started answering and editing posts on lynx browser also. But I would also like to favorite (the favorite button is an unhelpful link to current question), upvote and comment nicely, and as a side have a better interface than manually entering the URL https://<URL>.com/posts/<Question ID>/comments to open hidden comments. PS: I am now editing this post using lynx browser, thanks @KevinMontrose for the work. Though I like to be able to upvote questions and answers, I'll do that a few time a day if it did not require a graphical browser like firefox. Just a quick addendum to Joe's post, we'll have a pretty strong support plan in place for those that become disenfranchised from their accounts due to not seeing the message. While we're being really proactive about getting the word out, there's always going to be a few stragglers. When we pulled MathOverflow into the network after making major changes to how accounts are structured compared to the version of the SE 1.0 software they were using, we ended up having to manually fix quite a few accounts and it went remarkably well. So, we've got everything needed to support folks. It won't be the end of the world for anyone that misses the boat. There's also the case of benevolent bots, those that folks in our community create that need to log in to be useful. Reach out to us with any major concerns so that we can do what we can to coordinate (which could be as simple as guiding you to other larger projects working on the same thing where you could combine forces). The numbers seem too convincing for the decision but don't we need to consider each user group's activity/contribution to the community? The activities/contributions of 13k active OpenID users(which is 0.13% of total members) constitute only 0.13% of the total activity/contribution? Can you keep providing OpenID without accepting different OpenID providers? I understand the complexity involved in accepting many different logins. Surely that is (at least in great part) separate from the complexity of providing OpenID? One requires calling external APIs the other is providing one to the outside by only checking SE login. Or can you not have one without the other? Or does this question not make sense because it's basically what OAuth does? I'm not the most regular user of OpenID but it's sure nice to not have to create an account for every bug tracker or what not out there that I'll use only once. Stack Exchange is the only OpenID provider I can use, for reasons. I'm not in the same position as some other people who've used theirs for things other than testing, but I would still find some similar system extremely useful. Are there plans to provide a Stack Exchange OAuth? I'm one of those folks who's impacted though in the oddest of ways. I've used an openid provider I run myself as a backup since every so often, I run into workplaces that supply me with systems I don't trust. Being able to log into what's essentially a disposable set of credentials was kind of reassuring. That said? Considering the epic dead pool of openid providers, and what I read on various tweets, and the reactions of devs current and past? This has to be a good thing. It would be nice to have a "roll your own" sign on option - for folks who want to have their cake and eat it - and have SE login and a backup without needing to trust facebook or google. I half suspect the need for this on SE is relegated to the epically geeky however. ChatX is a ruby chat libarary which I wrote and maintain. I figured I could just migrate it to normal SE login, but it turns out that the "Log in with Stack Exchange" button to log in to chat actually POSTS to https://openid.stackexchange.com/affiliate/form/login/submit. Hence, this will also break when openid breaks. That leaves only google/facebook/yahoo oauth, which aren't really things we can migrate chatbots to easily. TL;DR I'd like to see a solid SE non-openid login form ASAP that I can migrate my stuff to. I understand removing code that very few uses. I use OpenID over Google/Facebook for anti-surveillance reasons. When you remove OpenID I understand I can still use username/password. Is there another alternative? If OAuth is still supported, can I be my own OAuth provider? If it's easy (big "if"), is there any chance of getting a site-agnostic global-auth login page at https://stackauth.com/users/login, for chat bots to use? It wouldn't be part of any user-facing website, so it wouldn't create any misleading expectations like preserving https://stackexchange.com/users/login. The bot libraries generally only take email and password to login, which means they don't know what sites the account has profiles on, so they don't know which site-specific login route to use. I don't mind your special partnerships with Facebook and Google. It's good business. The rest of us shouldn't also find ourselves shut out with this change however. then make life easy and go now and add your Google or Facebook credentials or set up email/password auth. I do not want to have neither a Google nor a Facebook account - and even if I had to, I would not want to link those to my account here. I expect that a good number of those active OpenID users will not be able to figure out how to migrate from the instructions in this question, or from anywhere else reasonably discoverable. See this post for details, but briefly: if you already have an email/password login, but have no idea what the password is (because you've been using OpenID for years), you can't use login-add, or the only other obvious link from mylogins (password-reset), or in fact anything else visible anywhere I can find on the site. What you have to do is go to account-recovery, which you would never find. Also, the relevant pages should be improved, but there are other questions for that: add-login page tries to auth existing email/password login. Decision to drop OpenID support is very unfortunate. I use OpenID as my preferred login method wherever possible. I would argue that most of those users using OpenID are probably also those more valuable in the community compared to masses of one visit facebook "users" and the likes. Why on earth would anyone want to use such account to login to SO? To brag about answering question infront of their "friends"? Someone must have hit the ground with their head really hard. On the note of simplification of code by removing OpenID. Since when it became a solution of a problem to "ignore the problem"? Is that why we write code? Do not think so. Making pretty pictures somewhat does not make much to support that. How you come to a conclusion that OpenID is a failure? I am using mojeid.cz as an authentication provider. The service is run by a non profit organization which is also maintaining our national TLD registry - CZ.NIC. It is steadily picking up traction and is on track to become nationwide login method with verified identity, to have same legal weight as declaring identity in person against state authorities. It is also gaining wide support on commercial sites as well. Thirdparty OpenID service allows me to login anywhere using two factor authentication, which has only a poor replacement in using google or even facebook with questionable "trust feeling". That does not feel as adequate replacement. How can we use prehistoric "mail+pass" with any sense of security and privacy compared to google and facebook login providers? Are you planing to add two phase authenticcation support for logging in with mail+pass? Keeping the OpenID support would be preferable from a not-a-noob user perspective. Please reconsider and DO NOT remove it. You should definitely show that banner for any user that is logged in via OpenID, not just when signing in. I, for example, am signed in with OpenID, but my last new login was in December. Additionally I have not received any emails yet and June is almost over. I have not registered an email on my Stack Exchange account, but I have one for Stack Overflow. Shutting it down habitually will have some ripple effects outside of SE/SO however. It's not just Stack-specific bots using the OpenID consumer. Many users here do utilize the OpenID provider too. For instance I get most useful flags on //freshcode.club from users with an StackExchange OpenID handle. They're not just more frequent than Yahoo logons, but inherently more trustworthy. IMO. Just measuring active SE logins falls a bit short of its actual impact. Code complexity might not warrant it. But all the maintenance and effort done over the years, wasn't spent on the local scope alone. Just got the notification as a user of OpenID. Personally, I'd prefer that over google/facebook. Just dropping in an "answer" with some misinformation following the closure of OpenID. I've been authenticating using my own provider and was just locked out of my account. I could not remember other logins and, being locked out, had no way to see them. Anyway I tried the email address that I use on here for a password reset and that got me in. If you initiated this request, reset your password here. Click the "more login options" link, enter "http://openid.url" in the OpenID field and click "Submit"
Which is obviously wrong. Just thought I'd point it out in case it was missed. I am sorry to see OpenID go. I remember writing my own Ruby module to authenticate users using OpenID; I remember how awkward it was to get it working. But it was fun... farewell OpenID. PS. As an alternative login, I second the idea of a GitHub option. It's the best fit for this site; I would personally never use Google to authenticate or Facebook for anything! (The shipped version depends on digest/hmac, which was removed around Ruby 2.2. Might be nice to get one. I have accounts on many StackExchange communities (and unfortunately I don't even remember all of them by heart -- I just login to them from time to time). 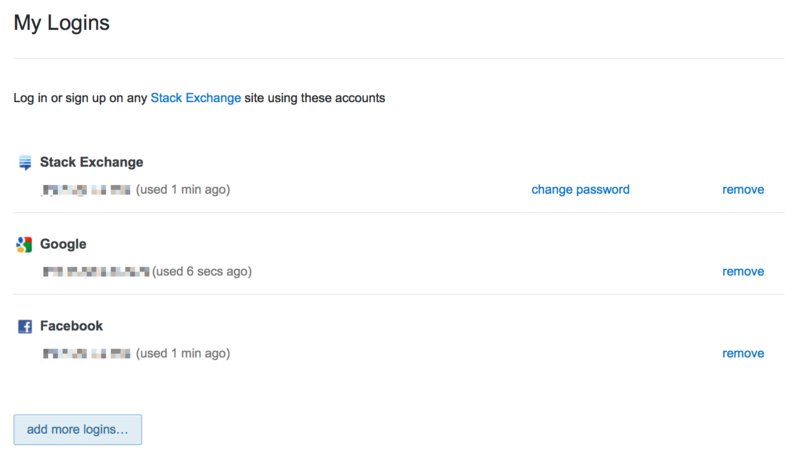 If I add another login method to StackOverflow, will it be added automatically to all other StackExchange communities? I wanted to ask if this change (affecting 14,000 users) was discussed on meta before the decision was made? Maybe I just missed it? I have a few questions, please. Using what I thought were my Stack Exchange Open ID (https://openid.stackexchange.com/) username and password to log in via email at SE sites seems to work. Is this because my login has been auto-migrated to email and password? Do I understand correctly that https://openid.stackexchange.com/ will, at some point, cease to be available? I don't believe I received any notification email or saw notifications at SE sites, and I only found out about this today due to actively searching after realising that the SE sites' login pages no longer have an option to log in with OpenID. If the software design is not complete garbage, the authentication method is implemented by an isolated module with a defined interface, right? Not the answer you're looking for? Browse other questions tagged discussion user-accounts stack-exchange-openid . Which Stack Exchange sites support Launchpad log ins? How can I access to my previous account? What OpenID providers should we feature on the /login page? How do I add a Google OpenID login?